OCat joliuertada, jurvert, julivertada, Cat julivert, MEng verde sawse, Eng green sauce. It is an emulsified sauce. In Spain this consists of herbs, vinegar and juice from the meat to accompany roe deer and veal. 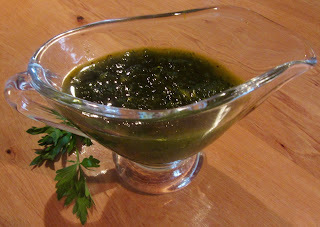 Sent Soví and Nola call it jurvert for the use of parsley to make it green. Nola’s is quite thick using bread as a thickener. The English Curye recipe is very similar to Sent Soví and Nola’s calling for parsley, sage and mint with cinnamon, ginger, pepper, wine, vinegar. Sent Soví uses hazelnuts as a thinkener while Curye uses bread. Josef Martínez Llopis likens it to allioli but says it has more flavor. Vilanova recommends it for mutton. Hieatt explains that these recipes go back to Apicius at least who provides a similar recipe for a fish sauce. See blog titled “manera, una” published February 24, 2016 for Nola’s recipe for a Parsley Dish and “cañarejo apio” for Sent Sovi’s recipe #CLXVI for a vinaigrette to accompany spit roasted mutton or goat published February 8, 2012. Select slices of beef. If not available use goat. Grind well. Cover with honey mixed with saffron, mashed and diluted. Add parsley sauce and salt to taste. If the meat, which is to be used, is roasted on a spit, so not use slices of beef or veal but raw meat from a ram’s belly. If not available use goat. See blog titled "perejil" published Mar 15, '17 for recipe.